Very cleaver – and lots of hard work I am sure. I too am Tosh. Hmm…. I’m Madelinetosh Vintage. Never used it before, but now that I see it, and see that it’s 100% merino which is my favourite type of yarn evereverever, I must say: your flowchart is very accurate! And awesome. Let’s not forget awesome. Love it, apparaently I’m Jamison & Smith 2 ply, which I must say I have never heard of. Hope it’s nice. I’m Jamieson & Smith 2 ply. I love that yarn 😉 I love your “something different” It’s so clever. Oh and I’m Cascade 220, which is one of my favourite workhorse yarns! AH! Love this! I’m Lorna’s Laces Shephard sock- so good! This is pretty much the best idea ever! Love it! I got Fyberspates 4-ply too! This is truly truly brilliant!! Brought back so many happy memories of crummy teenage girl mags from when I was a kid 🙂 Thank you! Haha exactly! Good old Just Seventeen, they really cornered the market on flowcharts in the 90s. Fyberspates Scrumptious 4-ply! But I was one question away from being Wollmeise 80/20 — dang you, whimsy! Brilliant!!!!!! Lots of fun. I love it. Too funny – I’m “Madelinetosh Vintage”… spot on, I must say! This is hilarious! Love it!! Love it! Hello, I’m Madelinetosh Vintage. Has rather a nice ring to it! Can I be a semi-solid red? So awesome! I’m Fyberspates, which is lovely, since I love that yarn. This creative post is so great! I’m Mad Tosh Vintage! Love it! Just made a hat with it, very squooshy, which a student has told me that I am…. Oooh, I’m Kidsilk Haze. I’ve never tried it, actually, but it sure looks nice. No offense taken here! This is brilliant, that must have taken a lot of work. I never would have thought to do something like this. That’s incredible, I love it! So fun and clever! I am Madeline tosh vintage but my inner yarn wishes it was Wollmeise. I love it! I’m Wollmeise, which I’ve never tried, but now I feel that I should :). I love it! I’m Jamieson & Smith 2-ply, but I could easily be Fyberspates Scrumptious, too. I love this. I’m a ball of Wollmeise, which is cool because I’ve never used it before. A lot of your respondents seem to be Tosh Vintage. It would be interesting to follow this up with a survey so you could see if there are any patterns to your results. Perhaps we’ll learn a little bit about the personality traits of knitters and crocheters. Well judging by the answers about your social life you have to give to reach it, I’d say that knitters must be exceptionally….close-knit. I’m a little late with this comment, but I’m really impressed! 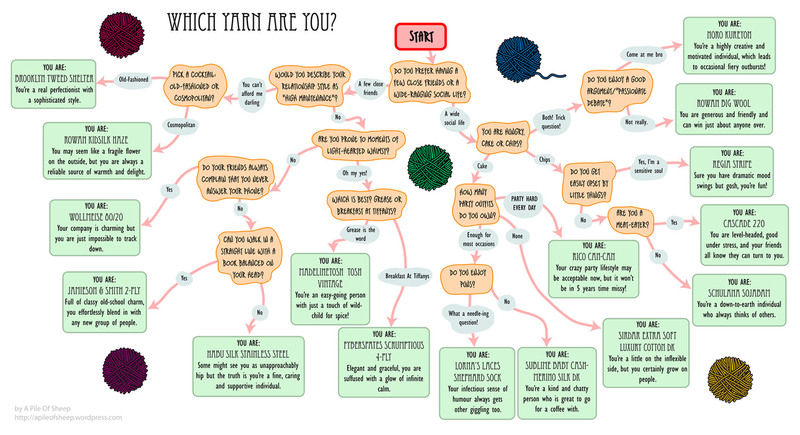 I didn’t look at any of the yarns on the chart beforehand and answered each question honestly… and got Tosh Vintage. Which just happens to be my favorite yarn in the world (I finished a new sweater design in it YESTERDAY. Seriously. ).